The World's Leading Expert in Survival From Collapsed Buildings Caused by Earthquakes or Explosions is Giving a Lecture at the Sheraton Hotel, Lima, Peru !! 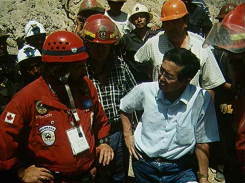 Here is Rescue Chief //American Rescue Team International, Douglas Copp, instructing President Fujimori and Prime Minister Pandolfi how to use the Mine Collapse/Life Locator. The Nasca Mine Collapse was one of 90 disasters Doug has worked, throughout the world. If you are living in Peru you have almost certainly seen the television and newspaper coverage of Douglas Copp, Rescue Chief of the American Rescue Team International working at the NASCA Mine Collapse/Earthquake with the Life Locating Devices. Douglas has given some of this survival information on the Learning Channel, the Discovery Channel, Home Box Office and networks throughout the entire world ( appearing on television in more than 120 countries so far this year). Already, this year, Douglas gave a series of lectures at the USA Embassy and American School, in Lima. This was preceeded by a series of lectures at multiple embassies and schools, in the Republic of China. Go to the ARTI website and see the glowing letter of praise from HBO television for our project of teaching people the simple, plain truth of 'How to Survive Building Collapse". See for yourself what actually happens when buildings collapse. You will never get under a desk again!! If your child is the only one in his classroom who has this information he will probably be the only one to survive. You will learn how to protect yourself and your family at home, at work and at school. You will get the benefit of practical, simple information that has resulted in Douglas surviving 1,500 life threatening situations and being known throughout the Spanish speaking world as 'La Cucaracha- The Survivor'. Doug has crawled inside of more than 700+ collapsed buildings, has worked most of the major disasters in the world for the last 12 years, and will teach you "How to Survive Building Collapse". Even if your building completely collapses in a heap of rubble, totally destroyed, you will probably not be injured or killed. 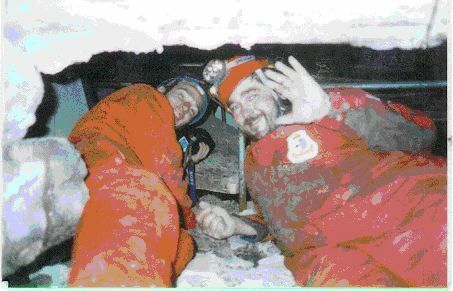 Doug Copp/Rescue Chief & Memo Tansriver/ expert in disarming explosive material inside of collapsed buildings. At the Sheraton, you will see a film made by Douglas with the co-operation of the Turkish Federal Government, The University of Istanbul and The city of Istanbul. This film which will be broadcast on 'Real TV', one of America's most popular tv shows, later this year. This film takes you inside of a collapsed school with the team. You will see how the team, in this scientific test, took survivability from 0% to 100%.Here we are inside of a collapsed school, in Turkey. We plan to continue the collapsed building test repeatedly throughout the world until children are never told to get under their desk again!. No amount of insurance, skill, knowledge or expertise and all the money in the world cannot give you and your family as much protection during an earthquake or explosion as you will have gained following this meeting with Douglas! Douglas will teach you and your family with simple, practical knowledge. You will be encouraged to ask specific questions about your home and business so you can be safe. This meeting is open to everyone! Day 1: Wednesday September 24, 1997. Cost: $50.per person. Day 2: Thursday, September 25, 1997. There will be a program for Corporate survival and recovery. Once you and your families have survived as individuals. Douglas will teach you how to make your business prosper in spite of a great disaster. Cost: $195. per corporate member for both days. The Sheraton will have an evening dinner, attended by many VIP'S for an additional $35. The National Fire Dept. of Peru is looking for a suitable building which requires demolition; If we can find a building we will repeat the test that we completed in Istanbul. The Learning Channel Program " How did they do that" will film the collapse and search inside. This will be broadcast to television viewers in 100+ countries. The total television audience for this event will exceed 100 million viewers (from all television programs resulting) If you are interested in becoming a corporate sponsor or you know of a suitable building. Please contact us. Other events and demonstrations will be provided by the Cuerpos de Bomberos del Peru. Thanks to Brig. Gen'l Victor Potesta Bastante, Commandandte Otto Lukac, Seccionario Maria del Pilar, Webmaster Gustavo Reyna and my many other friends with the National Fire Dept. of Peru. For further information concerning these events and to arrange participation please contact Douglas Copp at the Hotel Sheraton - Lima, Suite 1128; The national Fire Dept. of Peru at cgbvp@inei.gob.pe; To arrange for payment please contact Carmen Santa Cruz at the administration office of The Sheraton Hotel. ( tel 51-1-433-3320 or fax 51-1-433-5844 Individual site specific programs can also be arranged. All proceeds after costs will be used to save lives. Special discounts will be available for school teachers and others who will be in a position to multiply the number of lives saved from the information that they will learn. The American Rescue Team International has been there. We have seen it. We can assure you that survival is really a matter of knowing the right thing to do.